Home » Lifestyle » Peppermint Whipped Cream Is Officially in a Whole Foods Near You! 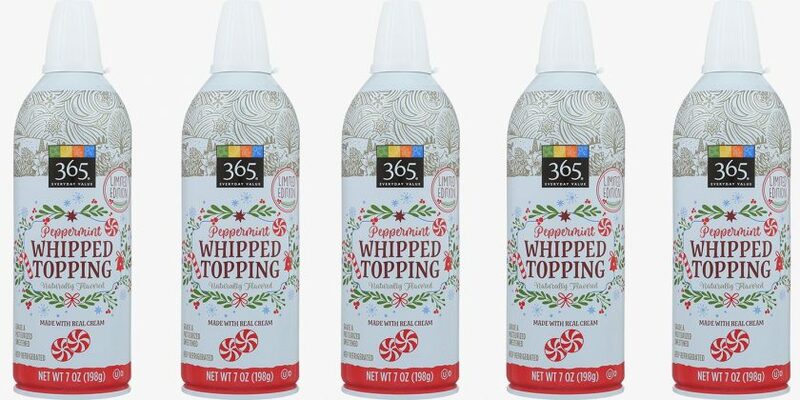 Peppermint Whipped Cream Is Officially in a Whole Foods Near You! Whole Foods Market is on a mission to amp up their whipped-cream game. It started with the pumpkin spice and maple vanilla flavors, and now it’s time to welcome the brand-new Peppermint Whipped Topping. The dessert topper is a product of 365 Everyday Value, Whole Foods’ private label. The Peppermint Whipped Topping is limited-edition and made with real cream. A Whole Foods PR rep confirmed to Best Products that one can is $3.99 and it is rolling out to locations throughout November. Other peppermint-flavored goodies new to the 365 Everyday Value brand this year are: Chocolate Candy Cane Sandwich Crème Cookies, Dark Chocolate Quinoa & Peppermint Bark Thins, Organic Pink Peppermint Ice Cream Bars, Organic Peppermint Coffee Pod, Organic Ground Peppermint Coffee, and Dark Chocolate Peppermint Sandwich Cookie. If you’re worried that peppermint-flavored foods will have a toothpaste-esque taste, clearly you’ve never had a Peppermint Mocha from Starbucks. What I’m trying to say is, peppermint-flavored foods are so good, and you should take advantage of all Whole Foods has to offer.